For all their lush colours and epic backdrops, Lady GaGa music videos tend to marvel and confuse in equal measure. The star’s latest, ‘G.U.Y’, is no exception. For while the short-film has taken the industry by storm since landing two days ago (a period in which it has racked up over 10 million views), it’s left some fans and critics scratching their heads. Alas, there’s no need to fret. 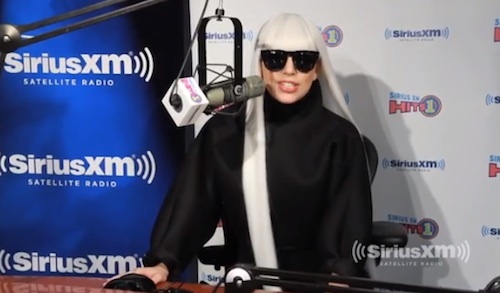 Mother Monster stopped by Sirus XM Radio today to promote the ‘ARTPOP’ clip, sharing fresh insight into its concept. An interesting watch, we must say. How typically GaGa! For every two sentences that did make sense, she’d offer another that threw everything off. Got to love her. Beyond her eccentricities, we’re loving seeing her charge on with her album campaign despite the slander of the naysayers. More power to her. I like that long floor length hair. If you are SINGLE and interested in black women dating white men, white women looking for black men, go to JOIN the best and largest Interracial dating site on —————- BlackMenDatingWhiteWomen. Ｏr g————. Thousands of Black Men, Black Women, White Men and White Women Free Join Here Everyday.Here a 100% safe, serious and real community for black & white single seeking interracial relationships, friendships, dating ,love and more. Gaga- pop artist on life support. There was no left to go but down…. Gaga….has more ugly wigs than #1 hits !!! Its so nice to see her excited about her music again. People really tried to tear her down, but when you have TALENT you will only rise to the occasion. Even if it takes months and months. This is why I stan for her, because she really is one of the best to ever do this. Don’t believe me? Watch the video for G.U.Y that SHE directed. Nobody cares….the struggle is real. Poor Fad, I wonder where her stans are hiding right now. No one cares about G.A.Y. in real life. It will flop and her career will effectively end. As GUY flops on iTunes, Monsters are pretending to go to the library to read. We get it, the video is hot but damn you’re acting like it’s doing something for Artpop when it has done absolutely NOTHING. That vomit publicity stunt was the last straw. Gang BangerZ will soon sell more copies than Artpop. You’re the weakest link, goodbye. Gaga – a jobless clown trying hard to stay relevant. She has a stupid video to promote…..
Oh, I thought that was a Fist Brown song, just like everyone else who has ever listened to that trash. A top 20 hit and it still can’t debut with Cierror numbers? Tragic. Monsters have gone to read? Lol nope, i’m here. Once again a fewking lone ranger. This is like the only day I have been here since before 3 PM. I usually have class, unlike most people on here who sit here on their Gateway laptop on welfare. FYI, there are very good gateway laptops, you just cannot afford them. I own a MacBook Pro, so no, I don’t know much about Gateway, just like no one knows about the flaming homo in your avi. Death, you own that overpriced piece of garbage, you’re one of those who drink the koolaid lmao. I can build a PC 10x better than a MacBook pro for a fraction of the price. Are you really so desperate to drag me that you want to fight about computers? I prefer Mac, you prefer PC. That’s all there is to it. Desperate? no; having fun? Well considering how easy it is to push your buttons, I will say yes. And you failed with that, as usual. It’s nice to see how obsessed you are with me, though. Well you replied, so it worked. Too bad Lana has to work extra hard for a Grammy. Just like the bottom in your avi has “worked” extra hard to become relevant and is still D list. Just like Lana has to work extra hard to hide her plastic surgery scars. I don’t know why she insist on prolonging this era, let it go, it hurts to see her going crazy for some poor sales, have some dignity. She’s prolonging it because she’s stubborn and oblivious to reality. She’s trying to prove she can do it by herself seeing that she fired all the people behind her career. P.S stay away from Colton. I agree, she’s not living in the re al world. That Booty is mine, sorry babe. What do you think Gags will have to do next era to comeback? I say dump the whole EDM 80s dance music theme, unfortunately for her she isn’t Rihanna and the only other genre she can do well is Jazz. Honestly, I don’t know, Artpop is a very commercial album, so i think the real problem here is her personality and her image is not helping either, she’s not s***, only a miracle can save her. Ya, it does look like the public is over her. Why all the hate? She’s very talented. She puts so much into her work. I’ll always be a fan, even when the music isn’t top notch. Love you, Ga! Lmao Rosie do you ever stfu? Do you ever get off my c***? You have more comments about me than you do in your fave’s Vogue post. Why all the hate u stupid bitchess, at least she tryin, even if she keeps flopping with this era at least she put out a HUGE video all by herself, when will the other b******? I agree her image ruined it this era but the music was good, she should start a new era with lighter image and a GUY video type of slayge and she will be just fine. I adore her, love this video, she is amazing….